Something’s fishy when a former president of the American Psychiatric Association (APA) reads the diary of a chemically-deranged mass killer and dismisses it in print as the story of a confused, distressed, and troubled young adult. It’s even fishier when he writes about a particular page, shown below, without mentioning the deranging chemical, “sertraline,” which is easy to see on the page (circled in green) but cropped out of the reproduction used in his article (circled in red). (Sertraline is the generic for Zoloft, an SSRI antidepressant drug made by Pfizer.) The former APA president, who published a book this spring called Shrinks, also failed to mention that sertraline was item three in a list Holmes called The Shrinks, too. That’s not exactly fishy, but it creates the impression that he preferred to keep psychiatry out of the discussion. Worse than merely fishy is the off-the-cuff evaluation that the former APA president, Dr. Jeffrey Lieberman, included in what he wrote about the diary for The Marshall Project. He hadn’t met Holmes, and didn’t have his permission to talk to reporters about his mental health. Crucially, given the difficulty of keeping a jury ignorant of media coverage during a trial, Lieberman’s ethical lapse on June 2 might have affected the the trial’s outcome. Seven days later, on June 9, the court suspected three jurors of lying about exposure to media coverage and dismissed them. Those three were bad liars. There might have been nine better liars sitting on the jury who heard Lieberman’s absurd, wrong, and reckless opinion and were influenced by it. In other words, Jeffrey Lieberman’s violation of Health Insurance Privacy and Portability Act (HIPAA) and medical ethics lapse might be the cause of Holmes’s death, if Colorado kills him. Something’s fishy, too, when the media miss a chance to drag a drug dealer’s name through the aftermath of a slaughter of innocents. This pusher, Dr. Lynne Fenton, had a little problem with the DEA a few years back, long before James Holmes stumbled into her care. I had to look her up on the state database to find out that a few years earlier, she had violated her oath and risked her livelihood to take the edge off her own and others’ tough lives. Once I’d seen how many times she’d made minor tranquilizers available to her husband, her employees, and herself, I searched the net for holmes dr fenton discliplined state board, expecting pages full of damning editorials with histrionic headlines. Nope. So I set Google to show me news from 2011 to 2012. In 2012, the year of Holmes’s crime, the media were pushing out story after story about her trashy habits. What’s going on? Why isn’t this immoral MD exposed for the creepy flake she is? It’s one thing to stick needles in women’s breasts for no reason. It’s another thing to hear what she heard from James Holmes and not handle the problem swiftly, with a military mindset. 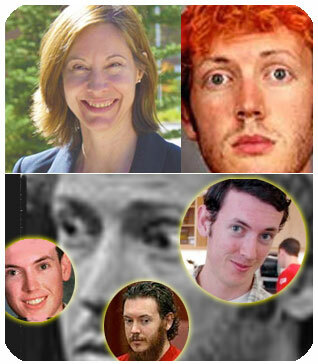 James Holmes graduated with honors from UC Riverside, which he’d attended on a merit scholarship. His roommates recall him as smart, witty, self-sufficient, and independent, but not alienated and not a loner. He had good references along with his grades. After working for a while, he was admitted to the Neuroscience Program at the Graduate School at the University of Colorado Anschutz Medical Campus. For all that, he wasn’t ordinary or well. He tried to kill himself at age 11, had bizarre beliefs, and thought about killing people a lot. But he had held it together well enough to be admitted to graduate school, and was positioned for a good career, if holding it together weren’t such an effort. People ask what happened. The record is clear. Fenton messed up. Holmes had taken no steps toward mounting a mass killing until after he encountered her, and her inexplicable, unsupportable treatment choices had addled his brain. She’s a known scofflaw druggie that Colorado should have sent packing and the university should not have hired. More significantly, she’s stupid. Her particular interest, in 2008, was “the neurobiology of psychotherapy, what happens in the brain with psychotherapy, and why does it work,” which sounds stupid, like pandering to the hotshot neuroscientists du jure. And prescribing dangerous drugs to a dangerous man was deathly stupid. What happens in the brain with drugs that cause violence and suicide, and why don’t they work, Fenton? That’s your homework. What did the university expect? Fenton’s MD was earned at Chicago Medical School, which has been on probation twice since 2004, when it was the only American medical school on probation. Its name was changed in 2004 to Rosalind Franklin University of Medicine and Science, and it’s in the 29th percentile for NIH funding. In 2007, it was in the 22nd percentile. NIH doesn’t offer older statistics. You’re dealing with a psychotic who is obsessed with killing, and you can’t have him taken to a hospital because he hasn’t described a plan. Idea 1: Tell him you think he is a risk to himself and others, and ask him if he will go voluntarily. Action: You might save one or more lives, and you might get sued. Inaction: He might kill one or more people, and you might get sued. When a police officer asked Holmes for an emergency contact after his arrest, he at first offered Fenton, not his parents. I don’t think he’d have sued her for ratting him out. Any red flags, Fenton? Well, just obsessive thoughts about killing. Surely he didn’t come across as a mass murderer? No, not exactly. He had three types of obsessive thoughts. Do tell. One that had to do with killing women, one that had to do with killing men, and one that had to do with killing everyone. Holy cow. So you made sure he took the horse tranqs? No, sertraline and Clonazepam. This study was terminated on July 11, 2007. The results of the primary endpoint analysis at the interim showed that the Zoloft group was not significantly different than the placebo on the primary endpoint and therefore the decision was made to terminate the trial. thinking about harming or killing yourself, or planning or trying to do so; extreme worry; agitation; panic attacks; aggressive behavior; irritability; acting without thinking; severe restlessness; and frenzied abnormal excitement. Okay, add clonazepam. She did not prescribe that, did she? Does she not check RXisk.org? agitation, irritability, anxiety, depression, acting on dangerous impulses, aggressive, angry, or violent behavior; mania (frenzied, abnormally excited mood), talking or thinking about wanting to hurt yourself or end your life, preoccupation with death and dying. Immediately prescribed antidepressants (fast acting benzos, long lasting SSRIs – Sertraline). Sertraline primarily antidepressant not anxiolytic. 3. Anxiety and depression both serotonergic system anyway though. No effect when needed. First appearance of mania occurs, not good mania. Anxiety and fear disappears. No more fear of failure. Fear of failure drove determination to improve, better and succeed in life. No fear of consequences. Primary drive aversion to hatred of mankind. Intense aversion of people, cause unknown. Began long ago, suppressed by greater fear of others. No more fear, hatred anchored. abnormal thoughts or behavioral disorder, anxiety, depression, hallucinations, personality changes, or loss of contact with reality; convulsions (seizures); insomnia; stomach and muscle cramps; tremor. She offered Seroquel, an antipsychotic tranquilizer, but not in a way that appealed to him. He declined that offer, regrettably. Although Seroquel, like any psychiatric drug, can have adverse and paradoxical effects, with any luck it would knocked him flat on his back and offset the sertraline. He was also prescribed propranolol, an anti-hypertensive and beta-blocker considered helpful in treating akathsisia, a hideous psychomotor side effect of antidepressants, tranquilizers, and mood stabilizers known to induce violence. If he had akathisia, he belonged in a hospital discontinuing drugs, not adding them. Propranolol itself can cause hallucinations, memory loss, and mental or mood changes. Some of what he wrote in his diary was confirmed in Dr. William’s Reid’s interview, which was played in court. Reid: What about the psychiatry with Fenton made the fear go away? Holmes: I thought the drug sertraline helped reduce anxiety and fear. Reid: It sounds a little like you’re saying, if you hadn’t had the medication, the shootings never would have taken place. Holmes: I’d say it was a possibility. So would a lot of people, including defense attorney, Daniel King. But here’s what happened when he tried to get at a possible role of the drugs in bringing on the attack. He was questioning an expert witness for the defense, psychiatrist Dr. Raquel Gur, about how the drugs might have affected Holmes. “With reduced anxiety from the [anxiety?] attacks, he could put more energy into planning for the attack,” Gur said. King asked again about the medications, but prosecutor Brauchler objected. After a bench conference, the objection was sustained. “If he’s so compelled to kill somebody, why didn’t he do it before?” King asked. It was just a “fleeting thought” before, she said. Fenton declined to be interviewed by Gur. 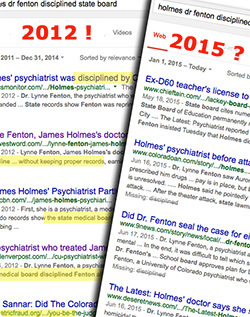 LA Times tells us she thought James Holmes might have been schizoid or schizotypal, according to her testimony. Like all the funny words invented to identify the people psychiatrists like to identify, these are funny words, not actual diseases, and the criteria for diagnosing them are stretchy. Schizoid refers to a loner who comes across as unemotional but might just be very shy and uncomfortable; schizotypal adds unusual beliefs and maybe a dash of paranoia, but not the outright breaks with reality that earn people a diagnosis of schizophrenia. First, individuals commonly experience negative or nonspecific clinical symptoms, such as depression, anxiety symptoms, social isolation and school/occupational failure. It wouldn’t be right to lay the whole thing on Fenton. She’s not the only one who thought it was okay for someone who said he felt like killing people to remain free. She had the cantankerous Robert Feinstein, a colleague, at her side. About a quarter of participants who experienced the simulations of a violent threat situation reported anxiety, sleep disturbances, increase in work safety concerns, and/or traumatic memories. …encourages us to continue developing our quality and safety program and to offer our easily reproducible and modifiable curriculum to others. Fenton had approached him for help with Holmes. He met with Holmes twice, with Fenton present, and didn’t see any reason to lock him up or prescribe a chemical straightjacket. He used a checklist, he said in court. (Ouija board out of service.) Feinstein, like Fenton, declined to be interviewed by Gur. “Kill” is a Figure of Speech now? She urged him to talk to his therapist after he said he was having thoughts about killing people. She thought it was philosophical, but was worried. I know what she means. Like when a dog growls at you? It’s philosophical. Go ahead and pet it. And off to therapy he went, which might have led to his failing an exam, dropping out of school, and shooting as many people as he could in a movie theater in the middle of the night. From his first appointment with [Roth] and continuing throughout his therapy, Holmes said he was fixated on killing people. Let’s learn more about Roth. Fenton says Roth described Holmes as one of the most anxious people she ever had seen. She thought he had obsessive-compulsive disorder, which means he seemed unable to stop thinking about something and feeling compelled to do it. Let’s see what compelled means. On vocabulary.com it means to force or drive someone to do something. It’s different from, say, consider, which means to think about, look at, or judge. There’s no need to continue in this way. I’m angry enough already, and I hope you are too. I’ve read about a woman gathering her up own guts after the shooting stopped and somehow surviving, with that image and heaven knows what other ones lodged in her mind. I see in the post-Fenton, post-shooting photos of Holmes the emotion-like, but automatic and meaningless expression of braindead speed freak, familiar from mug shots and anti-drug sites (right, collaged with two pre-graduate school photos and a 2015 courtroom photo with beard and mustache, and weight gain typical with antipsychotic use). I’ve never seen it anywhere else, and it’s not been seen on Holmes since the day he was arrested. News outlets let her off easy by not bringing up her past like they did in 2012. The Gazette in Colorado Springs did not mention her or the clinic in their timeline. Westward made the same omission. • March 16th: He went to the student clinic. • March 21: He met with Fenton, tells her he thinks about killing people 3-4 times a day, and she prescribes 50 mg of Zoloft and 50 mg of Clonazepam. • April: He listed himself on Match.com, with orange hair, and “Will you visit me in prison?” as a come-on at some point in April. • May 12: He ordered tear gas and gas masks on May 12th and went on to purchase weaponry and bomb-rigging materials. If he took the first one that day and one every day thereafter, he would have taken the last pill on July 10. If he had a few left from the previous prescription, or missed a day or two, he would have taken the last pill around July 15. 2) Dr. J. A. Lieberman helped her out by saying a mixed-up young man, not a madman, wrote the Holmes diary. 3) The prosecution and the judge shared the belief that the jury should not hear much from an expert witness about the ability of the drugs Fenton prescribed to cause psychosis and violence. Carol Leonnig at Washington Post had been unable to get the information from the university right after the murders and might not have got any had there not been a leak. It’s not surprising that only one lawsuit has been filed against Fenton. She and her drugs have been protected. The suit, brought by the young widow of a victim, was put on hold until after the trial. Little has been said about it since 2013. I hope she has forgiven herself. It’s those who should have known something might happen and those who help conceal what did happen who should never forgive themselves. Thanks. I needed that just now. Yet another psychiatric success story! And yet “the rest of the story” is swept under the rug. Thanks for the expose!